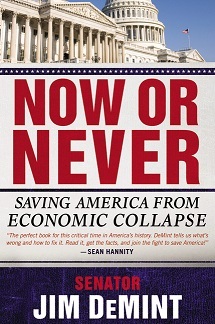 The name of the book, "Now Or Never," refers to two passages in the book, one communication-based and one partisan-based. On successful communication, DeMint writes, "Voters have to believe we are telling the truth when we say, 'It's now or never to save America.' Our message must be clear and persuasive." (p. 188, but that message is a hard-sell because it's repeated in just about every election). On the partisan side, DeMint writes, "Despite the devastating impact of Obama's policies, nearly half of Americans still support his reelection. Those who know better must be ready to fight for freedom in 2012--because it really is now or never." (p. 192, but that message has the same problem as the first one, that every presidential opponent describes every election that way_. The underlying purpose of this book, as we see it, is to popularize the Senate Conservatives Fund (pp. 215ff), the PAC founded by Sen. DeMint to fund conservative Senate candidates. DeMint is well-known for funding Tea Party-oriented GOP primary candidates who take on establishment Republicans. Two are cited heavily in this book. Tea Party favorite Rand Paul won the 2010 Kentucky GOP primary against the Republican establishment candidate Trey Grayson; Sen. Paul wrote the Foreword to this book. And Tea Party hero Pat Toomey won the 2010 Pennsylvania GOP primary by scaring away the RINO Arlen Specter; Sen. Toomey wrote the introduction to Chapter One. This book joins our growing collection of Tea Party literature. It's tough to find a generally-accepted definition of the Tea Party's beliefs. This book establishes those beliefs in members of the Senate who also claim membership in the Tea Party. See our book list below for the rest of our Tea Party collection. Jody Hice: 1.2 million deaths from abortions: far more than all US wars. Jim DeMint: No funding for Planned Parenthood; protect the unborn. Jody Hice: Economic stimulus package cost $278,000 per job created. Barack Obama: We don't need a Constitutional amendment to balance budget. Harry Reid: Cut, Cap and Balance is worst legislation in history. Jim DeMint: Spending is an addiction. Jim DeMint: Quantitative easing prints money & causes inflation. Milton Friedman: Government spends somebody else's money on somebody else. Pat Toomey: Fed role: legal system, currency & defense, within its means. Pat Toomey: We need statutory spending limits written into law. Rand Paul: Roll back federal spending to 2008 levels. Rand Paul: We are borrowing $40,000 per second. Ronald Reagan: Doubled the national debt from $1 trillion to $2 trillion. Jody Hice: Purpose of hate-crime legislation: normalize homosexuality. Jody Hice: Islam's geopolitics not protected by First Amendment. Jim DeMint: Gay marriage considered immoral by all the world's religions. Jody Hice: ENDA is really about forcing liberalism upon businesses. Jim DeMint: Eliminating business taxes makes US best at manufacturing. Marco Rubio: Most countries choose to have government run the economy. Jody Hice: Christian society discourages drug & alcohol use. Jody Hice: We allow Satanists in our schools, but not Christian prayer! Jim DeMint: NCLB should be called "More Children Left behind". Jim DeMint: Government-run schools can't instill morals and character. Jim DeMint: A-PLUS Act: allow states to operate like charter schools. Jim DeMint: Vouchers lead to competition, not re-segregation. Jim DeMint: Allow states to opt out of No Child Left Behind. David Vitter: 3D energy: Domestic jobs; Domestic energy; Deficit reduction. Jim DeMint: Secure and reliable market-based energy supply. Jim DeMint: Cash-for-Clunkers program was a stupid idea. Jody Hice: Liberal family policies lead to crime, gangs, and drugs. Mike Huckabee: Christian society discourages out-of-wedlock pregnancies. Jim DeMint: Dependency encourages social problems. Jody Hice: Islamists are radical and dangerous national enemies. Jody Hice: World hates America for our immoral freedom. Jody Hice: Constitution has Divine and miraculous origin. Jody Hice: Character matters, especially in elected representatives. Jody Hice: Easy prey in Congress for special interest money to trade. Jim DeMint: Feds have shut down kids' lemonade stands! Jim DeMint: Kept pledge for six-year Congressional term limit. Jim DeMint: Not federal government's job to do good deeds. Marco Rubio: America is greatest country; but not our government. Mike Lee: Congress constitutionally lacks general police powers. Mike Lee: Limited government must come politically, not judicially. Milton Friedman: The argument for collectivism is simple; free market is not. Pat Toomey: Kept pledge for six-year Congressional term limit. Rand Paul: Our legislative victory: an end to earmarks. Robert Bennett: Strong proponent of earmarks. Tea Party: We're gaining control of DC, but just getting started. Tom Coburn: We must have government that spends less and does less. Tom Coburn: Expose widespread waste and duplication in federal spending. Jim DeMint: 2nd Amendment view tells if you take Constitution seriously. Jim DeMint: Freedom solutions: cross-state insurers; health cooperatives. Rand Paul: Cut defense spending as part of cutting all federal spending. Scott Walker: Unions dislike it, but he was elected to take on sacred cows. Jody Hice: Freedom without Judeo-Christian context leads to corruption. Jody Hice: Islam is incompatible with America's founding principles. Jim DeMint: Dubbed "Senator Tea Party" at grassroots rallies. Jim DeMint: Judeo-Christian conservatism overcomes natural selfishness. Jim DeMint: American exceptionalism requires understanding biblical view. Jim DeMint: Many Democrats are sincere in their desire to help others. Jim DeMint: Select candidates by integrity of character, not promises. Marco Rubio: I am privileged to be citizen of greatest society in history. Pat Toomey: Campaigns against RINOs (Republicans In Name Only). Ron Johnson: Spent millions of own money to replace liberal Russ Feingold. Tea Party: Grassroots activists: not just Republicans, even some Dems. Tea Party: Bottom-up Tea Party differs from city to city. Jim DeMint: Social Security mess is another failed progressive policy. Jim DeMint: Tax-free lump sum payment as alternative to benefits. Jim DeMint: Transition younger workers into personal savings system. Lyndon Johnson: 1968: raided the Trust Fund to help pay for the Vietnam War. Tom Coburn: Pervasive fraud in the National Science Foundation. Jim DeMint: Too many Americans are dependent on federal government. Jim DeMint: Partner with churches to assist the poor.